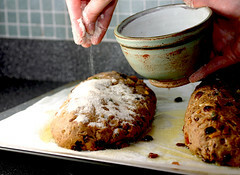 I’ve been working on stollen every weekend this month! You may have even read my about my endeavors on Facebook. I was bound and determined to emulate the Stollen from New Glarus bakery this year. After trying stollen recipes, I was slightly closer and about stollened out. The first one I tried had a most excellent flavor, but dang, it was so dense. The other two turned out only fairly okay, not enough spice and sort of fluffy. I wanted one that was somewhere right in the middle. So, off I went again to make the perfect recipe. I even made my own candied citrus! I tried two NYTimes recipes and one from Food.com. Here’s the NYT one that had the best flavor but didn’t rise AT ALL. The Food.com one was only fair and using bread flour made no difference at all. Then I tried the one in the new NYT Cookbook by Amanda Hesse, what a mamoth loaf that was! After much thought and consideration this was my last and most successful round. I’m never going to buy the New Glarus Stollen again, so I won’t know if I’ve hit the mark or not (I just moved the mark). This way I’ll always get it spot on! Plan ahead this bread takes a lot of time. Letting the loaves sit a couple of days really makes a HUGE difference. The flavors really have a chance to become enhanced. 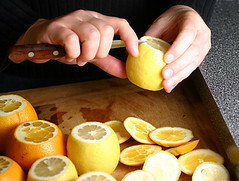 1/4 Cup chopped Candied Citrus optional, but it’s WONDERFUL! Chop it into tiny bits. Knead until fruit is distributed evenly and dough is smooth, adding more flour if necessary. Place in a lightly oiled bowl and let rise until doubled in size, 2 1/2 -3 hours. 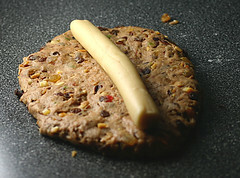 slightly off-center, fold the dough over and pinch down the edges. 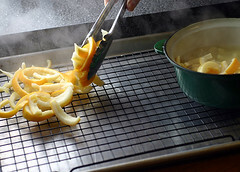 Place on an insulated baking sheet or just double up a couple of sheets. Cover with saran and let rise until just slightly under double in size 2+ hours. Brush loaves with melted butter. Bake at 350° for about an hour. Temp inside loaf should be 190° when they are done. 1/2 Cup of Melted Butter, letting butter soak into loaves. Sprinkle ginger sugar on tops and sides of loaves. When loaves are completely cool, store in ziploc bags over night. 1/2 cup confectioners sugar over loaves and serving. Never had Stollen before. That looks like a dessert that I would like with all the spices and dried fruits. I can’t wait to taste some of your Stollen. It’s my favorite Christmas bread!! Your final recipe sounds great!!! Good job, Mary!!! I thought Tea Ring was your favorite! Oh, my gosh…you went ALL out! What a beautiful stollen…I love the marzipan in the middle! Beautiful… I’m sure it’s just as delicious! That looks truly amazing. 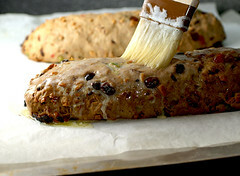 I’ve never made stollen before, but I’m awfully curious to try! Stollen wow! You’ve really put me in the Christmas spirit now! No worries about the link – your pics of the speculoos figures were great, really reminded me of being in Belgium! I printed this to save for next year!! Thanks!! Absolutely beautiful photos – congrats on making Top 9! OMG! Brent and I would just talking about Stollen the other day. He learned about it from a client he was styling. After the hair cut, he texted me to look it up and make it. Now I don’t have to look any further! I am sorry my response is so late. I have not been on Food Buzz in quite a long while. I apologize for that. The stollen looks amazing. I have eaten it once and it was delicious. The old adage “If at first you fail, try try again” works here. 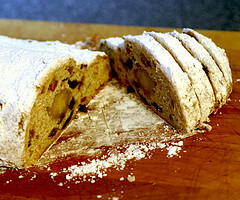 By the time it is December 2011, you will be back in the mood for stollen.